I was in Sydney a few days ago for the opening of the fifteenth annual Australian Bookbinders' Exhibition at the Art Gallery of NSW - a great catch-up with fellow binders and a chance to look at their latest work. The exhibition is very much about displaying the technical skills of the fine binder through contemporary design bindings. This year's exhibition features the work of twenty Australian and overseas binders and includes two of my own books - one of the pieces from the Curtains installation and The Book of Ampersands (above). The latter was imagined as the field notebook of a typographer out collecting ampersands. Bound in the French Simplified style and covered with various skivers, it contains the ampersands from 223 different fonts. The exhibition runs until 14 December. Details can be found here. 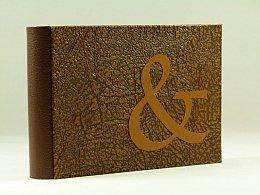 It was great fun Ronnie - the ampersand is such a beautiful character!